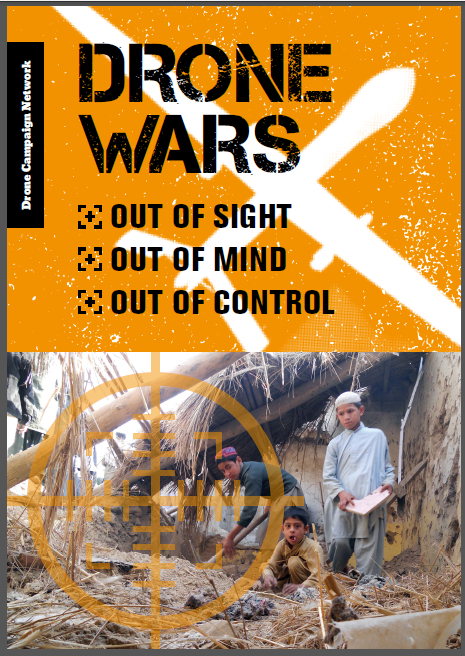 Click here for Drone News Podcast – Owen Bennett-Jones interviews Chris Cole of Drone Wars UK about these new figures. Six months on from the UK’s first drone strike against ISIS, new figures have been released by the Ministry of Defence (MoD) to Drone Wars UK detailing the number of air and drone strikes that have been undertaken by UK forces in Iraq. Responding to a Freedom of Information (FoI) request from Drone Wars UK, the MoD state that 202 British strikes have targeted ISIS in Iraq up until the end of March 2015. 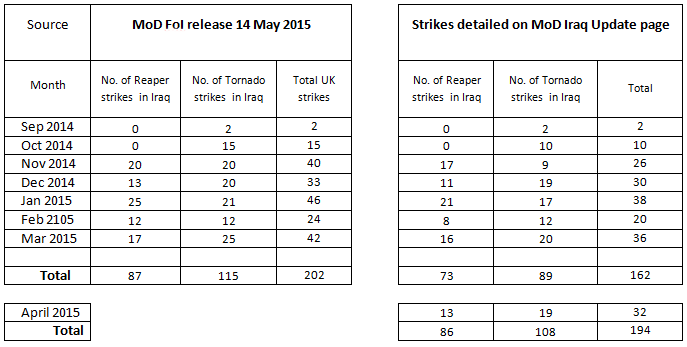 At least a further 32 strikes have taken place in April according to the MoD’s Iraq Update webpage giving a minimum total of 234 UK strikes in Iraq at the end of April 2015. 100 of these have been carried out by drones. While the Ministry of Defence gives brief details of some strikes on its Iraq Update web page, our latest Freedom of Information request reveals that details of about 20% of the strikes that have taken place in Iraq remain hidden.While this could conceivably be simply down to sloppy reporting, the MoD told Tom Watson MP in March 2015 that although the “over-riding principle is to seek to place information on each strike in the public domain in a prompt and timely manner”… “detail of each individual strike is carefully considered against the necessary constraint of maintaining operational security…” In reality although we have overall statistics on numbers of strikes, details of one in five of the UK’s air and drone strikes in Iraq are undisclosed. 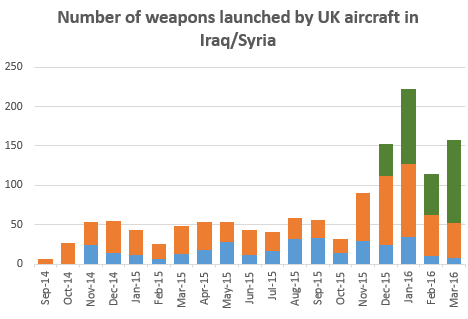 These figures also allow us for the first time to compare the term ‘missions with weapons released’ with ‘number of strikes’ and see that there is a clear difference. Researchers can sometimes equate the two terms but as we can see from these figures, a mission that releases weapons may include several air strikes. What are UK air strikes targeting? Analysis of the strikes that have been reported show that far from being used primarily for intelligence and surveillance purposes, as the MoD repeatedly insist, the UK’s Reaper drones are actually engaged in missile strikes as often as the UK’s dedicated strike aircraft operating in Iraq. According to the MoD’s Iraq updates, Reaper drones were undertaking strikes at an average of 3.5 strikes per week while the Tornado was launching weapons 3.6 times per week. In the 25 weeks that both aircraft have been operating in Iraq, we find that Reapers have undertaken 48% of UK strikes while the Tornado has undertaken 52%. Analysis of published information about what the two types of aircraft are targeting also shows there is little difference in the way they are operating and what each type of aircraft is targeting. *Note RAF Tornado aircraft began carrying out air strikes six weeks before the Reaper hence higher overall number of strikes for the Tornado. The real difference between the two types of aircraft becomes apparent when considering the reporting. While the UK is happy to report the number of Tornado aircraft taking part in strikes in Iraq and that they are flying from RAF Akrotiri in Cyprus, by contrast the UK refuses to give the number and location of UK Reaper drones taking part in strikes. This secrecy is echoed in reporting of the strikes. Out of the 108 Tornado strikes detailed, 85 (79%) have specific locational details given with an additional 14 have vague location details such as ‘western Iraq’. Only 9 Tornado strikes having no locational detail at all. By stark contrast only one Reaper strike – the very first – has specific location detail while 47 (55%) have vague locational details such as ‘Northern Iraq’. 43% of the Reaper strikes have no locational detail at all. 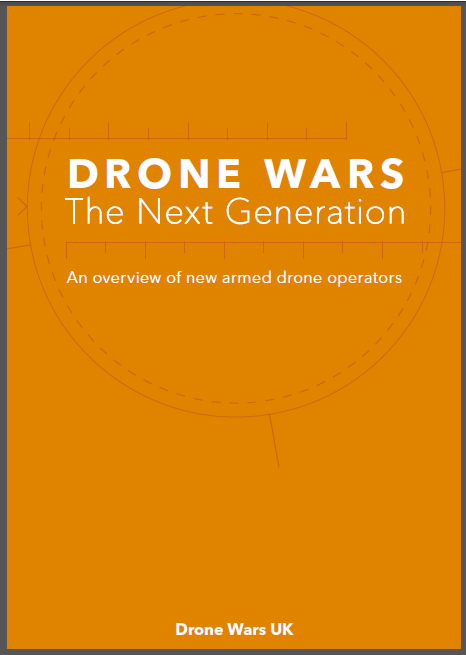 While the MoD continues to insists that there is no difference between a Reaper strike and a strike from a ‘manned’ aircraft – leaving aside the ethical arguments about risk and remoteness – in practice there is a clear difference in how much detail the MoD is willing to share about the operations of each type of aircraft with much lower levels of accountability for drones. This is ominous for the future. 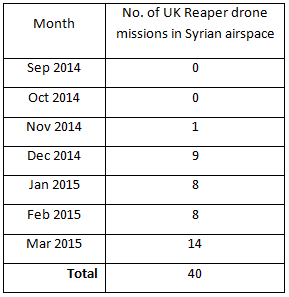 The MoD’s Freedom of Information response also brings further details about the overall numbers of UK drone missions have been carried out in Syria. 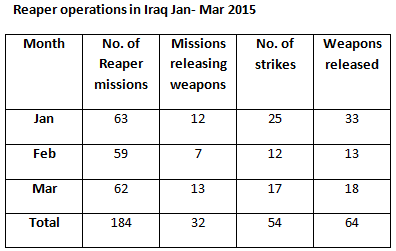 Although parliament expressly granted authorisation only for the use of military force in Iraq, there have been 40 UK armed Reaper missions there up until the end of March – likely now to be beyond 50. No details about these missions have been released but the MoD says no UK weapons have been released by UK Reapers in Syria. Junior Foreign Office minister Tobias Ellwood stated in a written answer in February that the UK was “providing intelligence and surveillance to support coalition partners, who are carrying out air strikes in Syria against ISIL” and it is likely that information from UK Reapers operating in Syria is being used to carry out strikes there. For more information on the US Coalition air strikes in Iraq and Syria see Airwars.org. ‹ Book Review: ‘Sudden Justice: America’s Secret Drone Wars’ by Chris Woods.